Fans of Robert Dugoni’s brainy, tortured detective, rejoice: Tracy Crosswhite is back --- and better than ever. In THE TRAPPED GIRL, Dugoni’s fourth Tracy Crosswhite mystery, Tracy and her colorful colleagues team up to investigate a bizarre murder with tons of loose ends. As their investigation takes them farther and farther away from the scene of the crime, and they struggle to navigate various bureaucratic obstacles, it becomes clear that they will all need to work together in order to solve this complicated case. All the while, Tracy must battle her inability to detach herself from cases involving women and question how it may affect her personal relationships, especially with Dan, her longtime boyfriend. 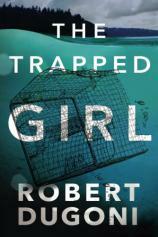 THE TRAPPED GIRL opens on a quiet Seattle morning as a teenager named Kurt Schill prepares to check on his illegal crabbing pot in a remote section of the Puget Sound. When he lifts his unusually heavy trap, however, he is horrified to see a female hand slip out complete with chipped blue nail polish. Forgetting that he is breaking the law as well, he quickly calls for help. "Tracy has grown so much since HER SISTER’S GRAVE, and it is wonderful to see such a beloved character finally at peace with her past.... THE TRAPPED GIRL is easily Dugoni’s best work to date, and I cannot wait to see Tracy and the team come back in the next installment." Before long, everyone’s favorite detective is on the scene. This fourth installment sees Tracy more confident than ever, having gained the respect of nearly all of her peers after her capture of the Cowboy, a notorious serial killer. As always, she is calm, cool and professional despite the garish crime scene and complications of removing a body in a crab trap amidst locals and tourists. Given the state of the body, it is incredibly hard to identify --- an issue that only becomes more difficult when it is revealed that the deceased woman recently had reconstructive facial implant surgery. After sidestepping a few false leads, Tracy and her team find a name: Lynn Hoff. But when they are unable to discover any information about her, it becomes clear that Lynn was a pseudonym and whoever was murdered in the Sound was definitely hiding from someone. Dugoni’s chapters chronicling Tracy’s detective work are interspersed with ones written in a journal format and set about a year earlier. The diarist, we come to learn, is Andrea, a bookish young woman with a traumatic past whose only wish is to blend into the background. When she attends a party one night, however, her life is forever changed by a chance meeting with a smarmy lawyer named Graham. The two soon marry, but it is not long before their relationship --- and life --- begins to crumble. Although Andrea has long since disappeared, and Graham is not even a remotely sympathetic character, the case falls outside of Tracy’s jurisdiction. Longtime readers of the series will remember that Tracy has struggled with red tape before, often with numerous higher-ups questioning her actions with petty, gendered assumptions about her abilities. Unfortunately for Tracy and her case, not much has changed there --- though she is certainly adept at bending the rules to help her investigate as best she can. The juxtaposition of Tracy’s mysterious Jane Doe and the deeply personal journals of a woman with every reason to want to escape will make many readers believe they can guess what has happened to Andrea. Of course, given Dugoni’s natural talent for plotting and pacing, the truth is much more complicated than it seems. After Tracy and her team follow numerous false leads --- some involving hilarious lakeside scenes with fan favorites Faz and Del --- Andrea starts to seem less and less innocent. But with her supervisor breathing down her neck and jealous men questioning her at every turn, will Tracy ever be able to see her case through to the end? Dugoni has always been able to create cases with a “ripped from the headlines” feel, and the one at the heart of THE TRAPPED GIRL is no different. This exquisitely complicated case, combined with Dugoni’s cinematic writing, will give readers exactly the suspense and intrigue that was missing from the previous installment, IN THE CLEARING. After separating Tracy from her team for a bit, Dugoni has reunited all of his best characters and taken great steps to flesh out every single one, from Tracy and her beau to Faz, Del and even Nolesco. Tracy has grown so much since HER SISTER’S GRAVE, and it is wonderful to see such a beloved character finally at peace with her past. Similarly, although I have always enjoyed Dugoni’s supplementary characters, I have never rooted for them or cared for them as I do now --- particularly when it comes to Faz and Del. THE TRAPPED GIRL is easily Dugoni’s best work to date, and I cannot wait to see Tracy and the team come back in the next installment.